We left home (Toronto,ON) around 7am and were on the water by 2pm. Once past Massey the last two hours were on a very well maintained logging road. Ours was the only car in the large parking lot with grassy campsites, no cars, no people, no wind and a gorgeous sky, a good beginning to our trip. We decided to do the trip counter clockwise and proceeded to the main body of the lake, the huge lake was like glass in the middle of the afternoon. We checked the campsites as transposed from Kevin Callan's book, numbered by Darryl so we could easily refer to them. Great afternoon shade, good view, nice grassy tent pad and bugs galore. Tent blasted by sunshine at 5.30 in the morning (argh, grrr). With the lake still like a mirror we decided to investigate the last campsite before heading up the river. 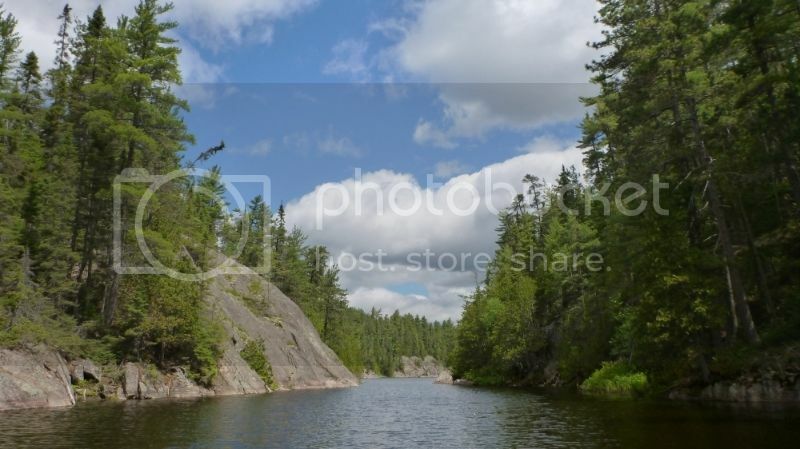 C16 did not exist but we came upon a great rocky jack pine campsite on the last point before before the river. Interesting site with a great view and sunning rocks, if we had come this far yesterday for certain we would have stayed here, it's already been used this season (C16 was probably just misplaced on the map). Once on the water I started messing around with some of the gear and eventually came to the realization that my right hand paddle glove had gone missing, a quick paddle back ascertained that it must have fallen in the water and is now with the fishes. This is a worry, day 2 and I'm down to one glove, I always paddle with full gloves. Darryl now discovers that he left the sunscreen behind at the car, I have visions of a bug bitten blistered sunburned hand. Beautiful paddle up the meandering river (came upon a feeding moose) which became narrower and eventually swallowed out to a huge beaver dam. 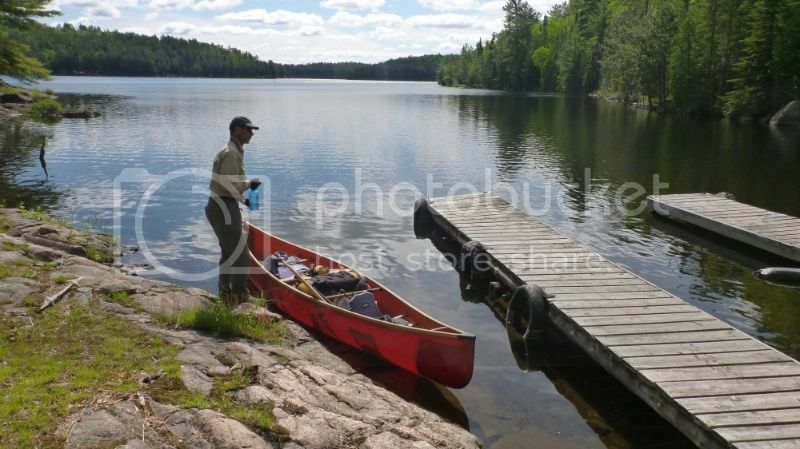 More paddling and a nice campsite on the portage. Very low water past the portage with Darryl wading the canoe upstream while I made my way along bushes/trees on shore (I found the bugs…). No sign of C14, C13 is a boat cache. 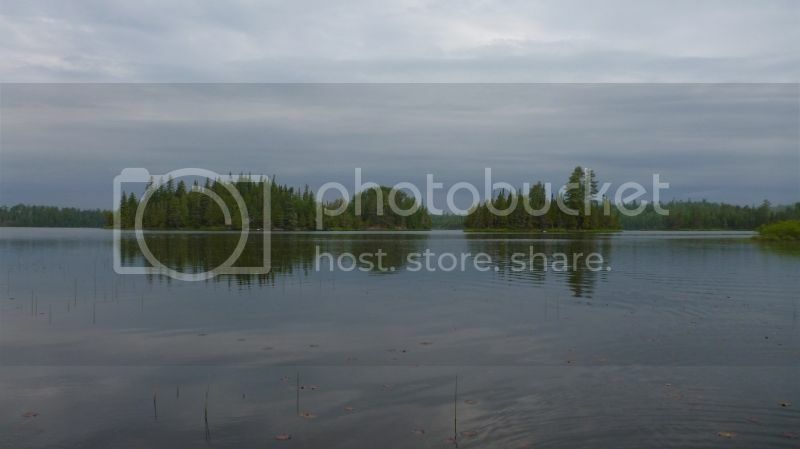 We paddled into a large lake along the Riviere Aux Sable, Big Trout Lake I think, it's absolutely beautiful with a shoreline begging to be explored (we must come back another time). 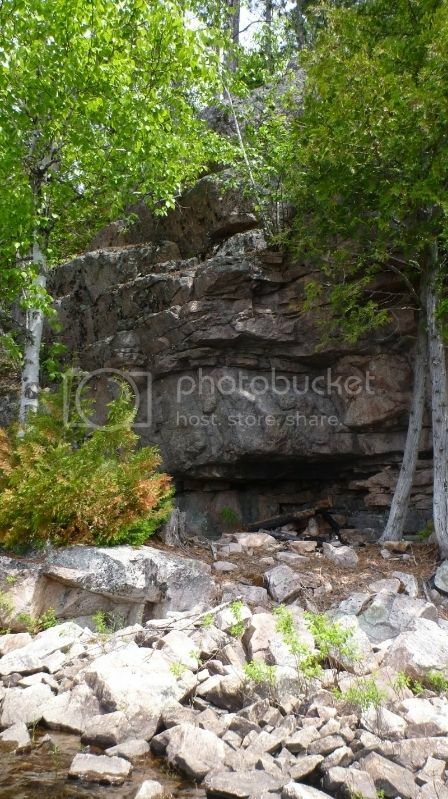 Paddling along the east shore we passed a fire pit under a rock overhang, very curious since you can't get to it from land and it's an awkward landing from the water, maybe it's from winter travelers. Once on Long Lake we investigated C11, it's a “used to be” campsite, it would take a lot of rehabilitation to make it usable again. We stayed at C12, very sheltered, shady and high off the water, it would be a good site anywhere and very welcome after a long day. Already used this season, someone left a large pile of split wood and fire starter material, very nice. 7.5 hr day, a long day for us. Yesterday's hot and muggy weather has turned cold and wet. Rain started overnight and continued through most of the day. Neither of us is interested in packing up to face the wet portages. This is a day off - it's Sunday - time to read and bake a bannock. It feels like the back of beyond, no man made sounds, just the grouse doing their thing in the bush, lots of them. Heard and caught a glimpse of a moose walking along the shore. Found a pair of thin work gloves at the bottom of the barrel, “found gloves” from some past trip according to Darryl, too small for him but the right hand glove will work just fine for me with a hair elastic around the wrist to keep it from falling off, so happy that I don't have to resort to mole skinning my fingers which were starting to develop hot spots from yesterday's paddle. 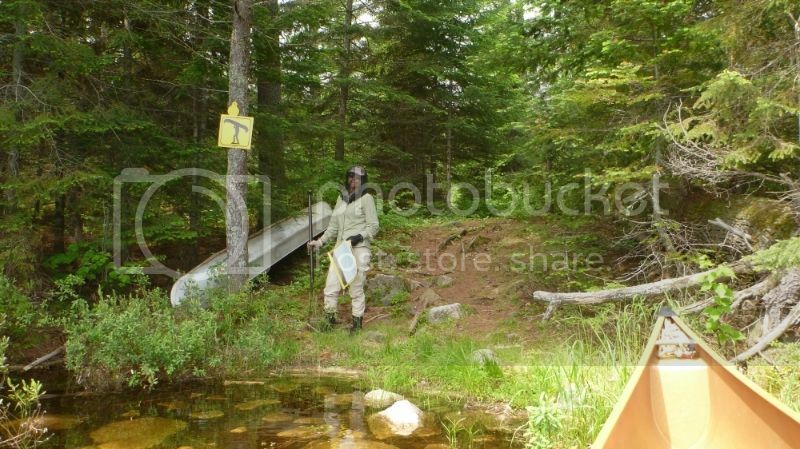 Short portage into Boumage Lake, C10 is a fine campsite, if we had come this far I would have been happy to stay here. 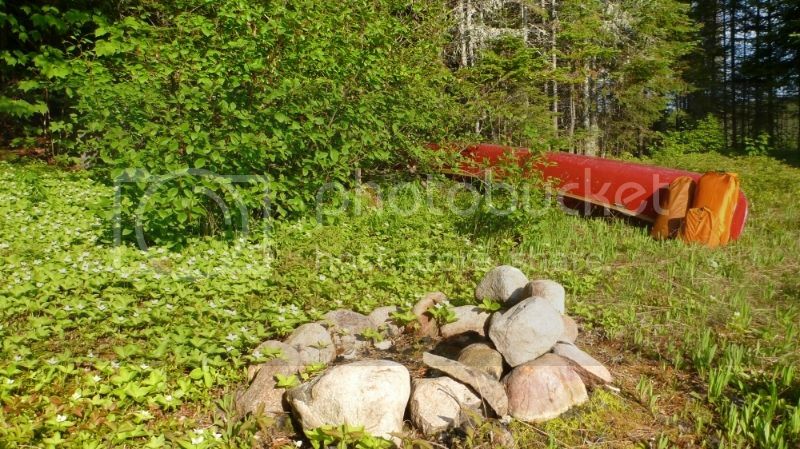 A real portage sign on the long portage into Bark Lake. Cinch up the shoelaces to handle the various challenges - bogs, boulders, slippery logs and slimy mud. 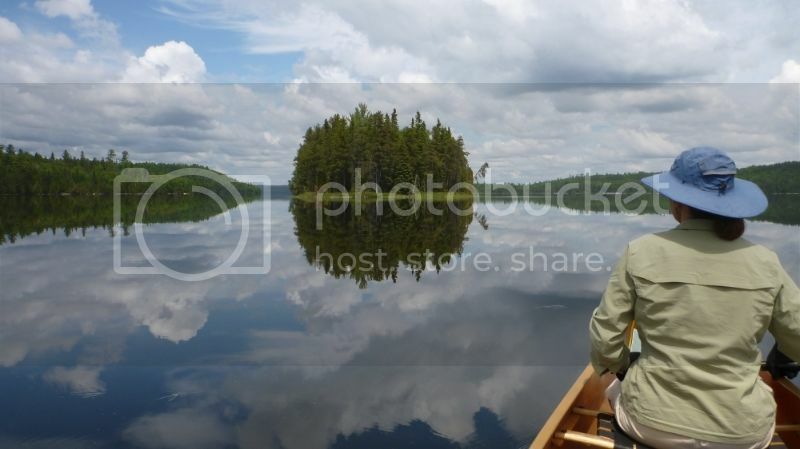 We paddled north on Bark Lake towards our quest for Gray Owl's cabin, really just an excuse to explore this huge lake. C5 is a thin ridge on a spit of land. C6 exists but has not been used in years, lots of fallen wood everywhere, would require a thorough clean up. The rocks we avoided on reaching the beach was the submerged fire ring!! 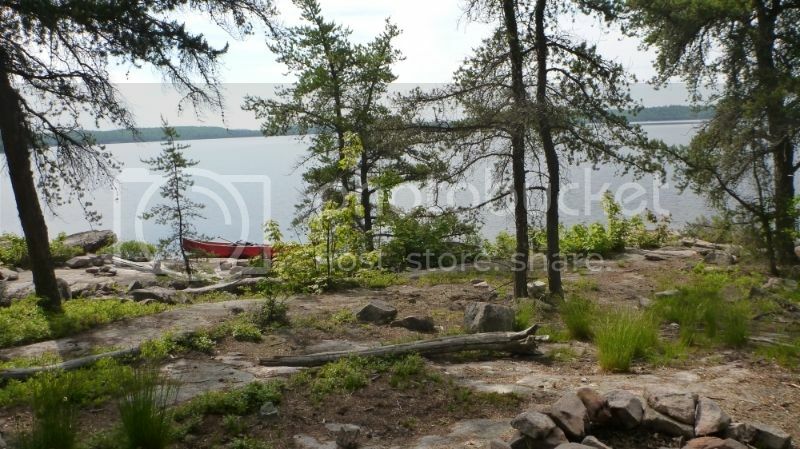 We decide to try for C9 situated behind a big island not too far from Grey Owl's cabin on the theory that maybe people would camp there to take a break and visit. We make straight for the big island, the big sunny rocks and accessible shoreline calling to us. Out from one of the bays a tiny orange put-put motor boat crosses far in front of us and disappears down another bay, we were starting to think this was an empty lake. On the island, the huge pile of rocks proves to be a partly collapsed fire pit. We have found our campsite for the next two nights, sheltered from the north and west with an expansive view. This site is not on our map and has not been used for some time though we found a nalgene and sunglasses that will see further use. The put-put came back and one of the occupants strung out a net between two floats near our island, all very curious. Ah-ah.. it's Monday, they are working, these are MNR people doing some sort of fish survey, we saw a notice about it at the launch parking lot. Soon we're buzzed by a float plane heading towards Grey Owl's cabin, it turns around and goes back to wherever it came from, lots of action all of a sudden. Hot and muggy, barometer low. The wind changed to north overnight, the expected rain didn't happen. The put-put came back, crisscrossed the lake, picked up the net and disappeared. We set off to see Grey Owl's cabin after a leisurely breakfast. Lots of construction on a new outpost camp and dock for Glassy Bay Outfitters, spitting distance from GO's cabin. This outpost explains yesterday's plane, they must have been giving somebody a tour, according to their website it's supposed to open this year. I believe GO's cabin to be the sturdy boarded up wooden building though I was hoping it might be the tiny pink cabin beside it. We spent the rest of the day exploring some of the many bays while sheltering from the now strong west wind. C9 proved to be no more then a broken down fire circle, we were lucky finding our campsite. We stopped again at C8 for a closer look, fantastic hug rocks but there's only an old moss covered fire circle remaining of what once would have been a picturesque site. We passed two boats going north, two old timers in a rusty bucket and two others in a peeling green run-about, they sure looked happy. Crashing waves and gusting wind drove us back from the shallow narrows half way down the lake, we took the opportunity to have lunch and wait for the wind and waves to calm down. We eventually made our way south riding the waves and enjoying an exhilarating paddle in our little canoe. 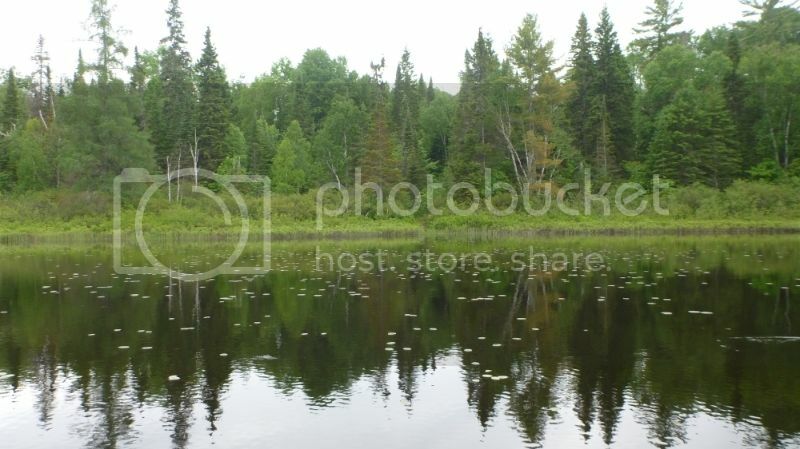 Bark Lake is a big beautiful lake but you better know where to find the campsites, the shore is all bushy bush. We were happy to find that the marked island campsite on the south end of the lake exists. The landing area had a mountain of walleye heads, spines and skins, let's hope there are no bears around. This campsite has already been used this season. It's a testament to how few people paddle this loop that we have found so few campsites and the ones that show use are one day's travel apart. This end of the lake is not as dramatic but has more wild life, many eagles and the unique sound of sandhill cranes. Darryl even had the loons responding to his calls. Woke up to a very heavy sky, the barometer is way down, we're in for it. Darryl made a big breakfast, this is a portage day and we need the energy. Thank you to whoever left the flagging tape to mark the portage, without it we would have spent some time looking for the portage. Got through the first portage, thunder and a deluge caught up with us at the end of the second portage, we took shelter under the canoe along along with hundreds of mosquitoes. Thirty minutes later got back in the water to clearing blue skies. Much fun hissing back and forth with a family of otters. 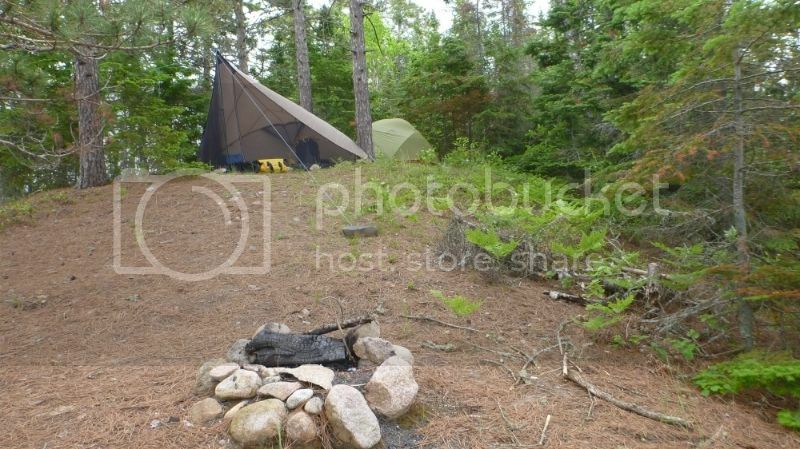 There's a campsite at the portage out of Star Lake with a headboard and kitchen sink, etc scattered about. The next portage challenge included huge boulders still slippery from the rain, we paddled on through a shallow lily pad covered creek, a beautiful valley, the sun is shining but there are a few marauding dark clouds. We took out at a beaver dam by the snowmobile sign (we have followed many of these signs so far on the trip) but where is the trail!!! There was more water further past the beaver dam so we got back into the canoe and did a creative lift-over over the logjam into Poupore Lake. C02 at the north end of the lake does not exist, the dark clouds are catching up and we're paddling with a purpose. We finally get to the island campsite towards the south end of the lake and start putting up the mantis tarp like crazy people, the wind hits like a wall and the rain comes down in buckets. It's all over in ten minutes and the sun is back. We love our island and so does a little sandpiper, he goes here and there with a teetering gait and a teet-teet call, up and down every path on the island. Camp chipmunks we know, first time for a sandpiper. The former Moosewa Outfitters at the south end of the lake is now the Moosewa Club. 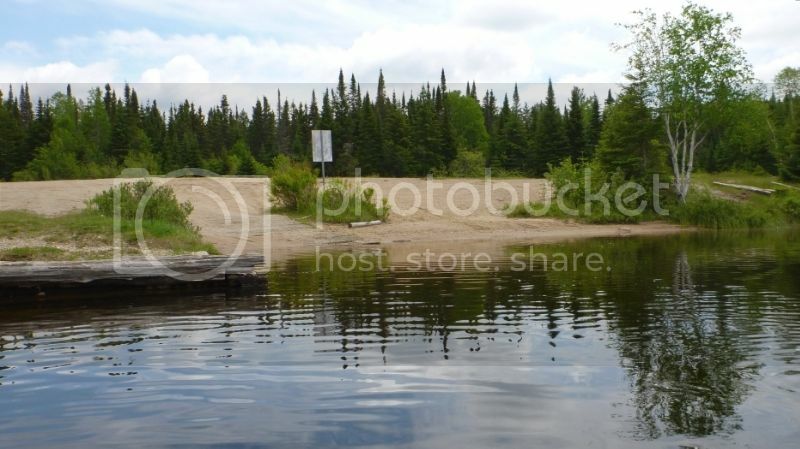 The short portage out the lake ends at their very fine dock on Lac aux Sables. I took the time to walk the snowmobile log bridge across the dam/water fall halfway along the portage. Very pretty view towards Lac aux Sables. A short paddle got us to the car and we were on the road by 11.30 am. Saw a bear with two cubs on the drive out along the logging road. Another great trip, would love to go back and do the loop in the other direction. Nice trip report. I've done this loop a couple times- the last time was around four years ago. I went counterclockwise both times. I like the map and how you labelled the campsites. How was the road to Lac Aux Sables? The first time I drove down it my muffler got a hole in it, so the second time I paid to park at the landing near Ritchie Falls. Can you drive between Ritchie Falls and Lac Aux Sables with a sedan these days? We stayed at C17 four years ago! First night too. It was a stormy and windy paddle across Lac Aux Sables the evening we arrived. C19 does exist. The Island has a couple places that could be possible campsites. I think the the "official" one is on the south side of the island in a kind of dark clearing. C14 is almost directly across from the portage landing and has room for about three tents. It's not much for swimming though. 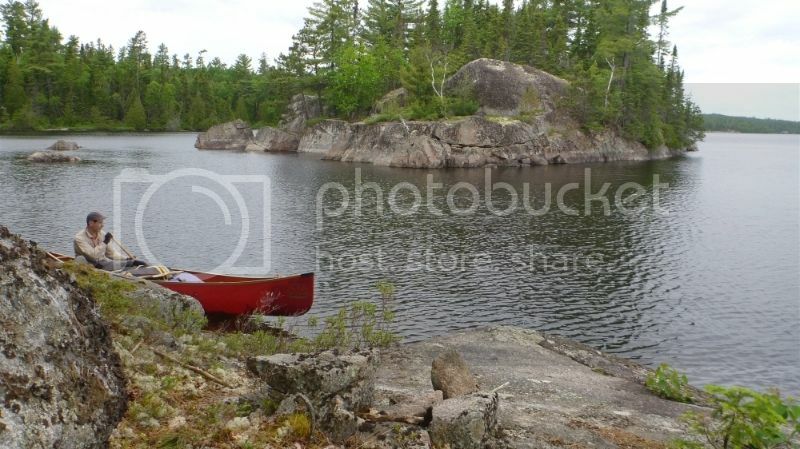 You mentioned the items on the Star Lake portage... I remember reading somewhere that there used to be a cabin at that location. We stayed there on the last trip and picked up a lot of broken glass. Your trip looks like it was fun. Despite going twice, I didn't make it to Grey Owl's cabin. 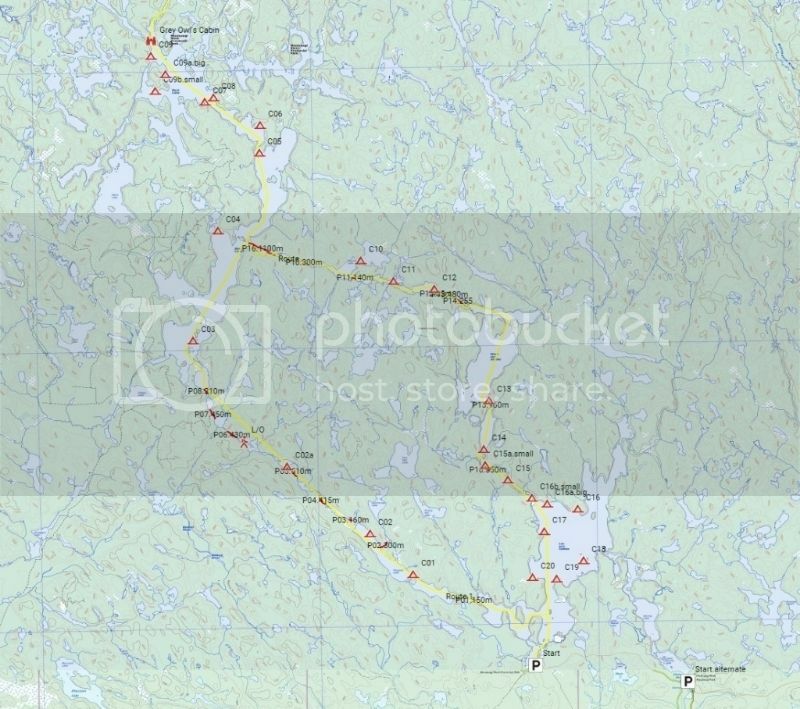 Hi Brad, yes the road from Richie Falls to the big parking area at Lac Aux Sables is in top condition for a gravel road (as of June-2015). A lot of heavy equipment (Logging) is actively using and maintaining that section and beyond. I was mentally debating on whether we should proceed in a clockwise or anti-clockwise route on the 7 hour drive up. 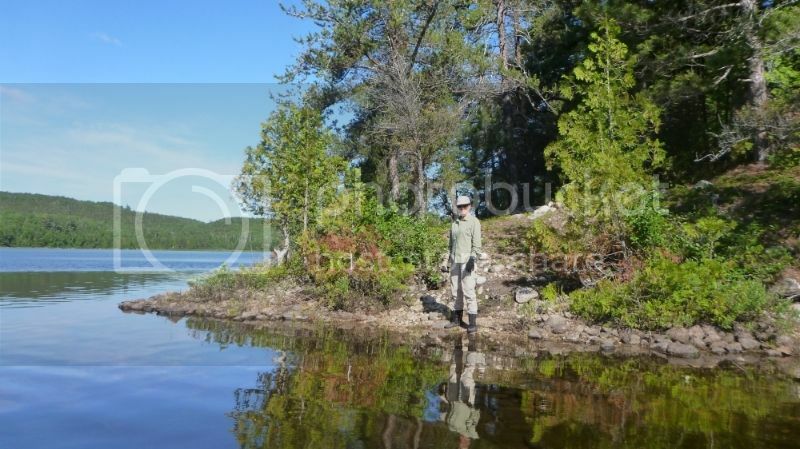 The placid condition on Lac Aux Sable itself tipped the decision to proceed anti-clockwise. You can tell from the campsite numbering and portages that I was leaning towards doing the loop clockwise. 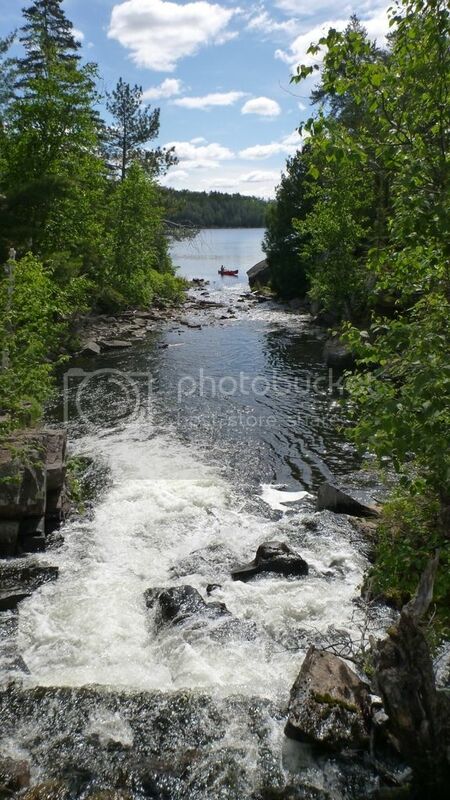 In June with decent water flowing in the Riviere Aux Sable we could have stayed in the canoe a bit more going downstream rather then track/wade the boat upstream. The water temperature was fine for wading upstream, the may not be the case in a May trip. 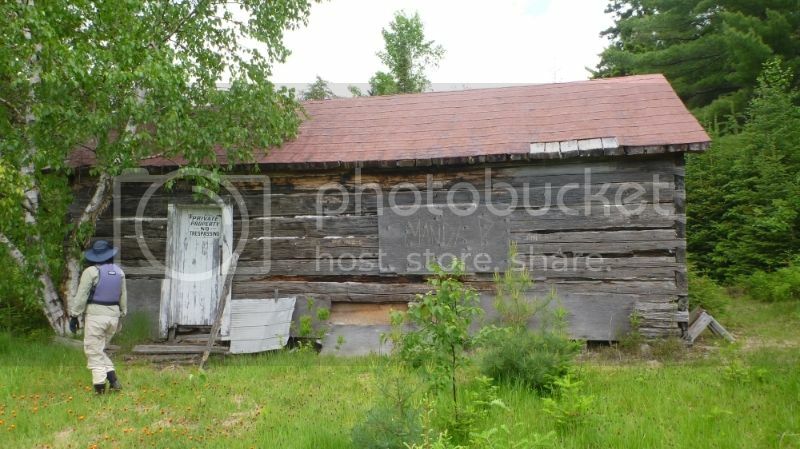 It was a slight disappointment to see Archie Belaney's cabin sold off to private hands. A little plaque or notice of the cabins history would have been preferable. 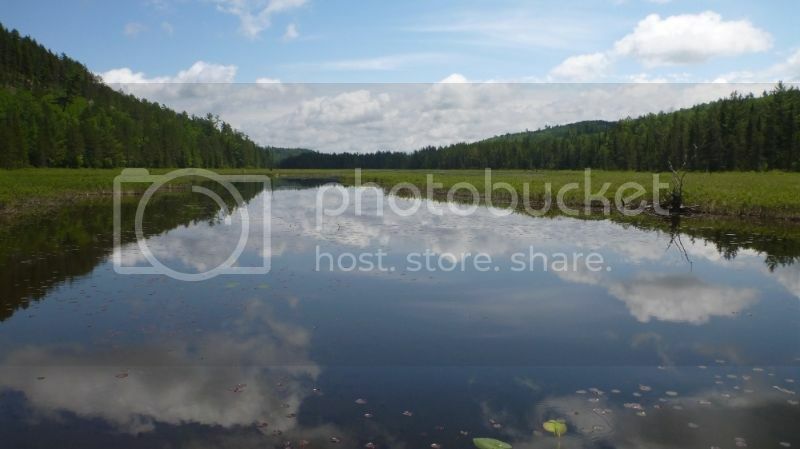 I loved the area and will be returning the the Mississaugi watershed. Do you think this would be a possible trip in the last half of August, after bear hunt starts? I don't know what kind of noise and activity the hunt brings to the area. Would it be noisy? Would it be safe? Would water levels pose much of a concern? Would the area still be attractive during the end of summer, or would it be dried up lakes and rocky paths? Yes being in the outdoors during hunting season is safe....just don't walk into a bear bait! Last time I did this route bear season was on. No problems. I echo Grey Jay. We were in twice during the bear hunt and it was fine. To me it didn't seem that the hunters really ventured that far from Richie Falls. Wear orange of some type for safety, but I'd be surprised if you hear many (any?) gunshots. As Grey Jay mentioned, the bear bait could be a concern. The first time through the lodge operator (at the east end of Poupore Lake) warned us not to camp in certain locations on the lake due to bear baiting. When I was through last year it appeared as if the lodge was not operating though. Before setting up a camp on the south lakes you might want to have a look around to be sure that there isn't a baiting station nearby. The Aux Sables River will be low in spots and you will likely have to wade the canoe, but there should still be enough water to float it. 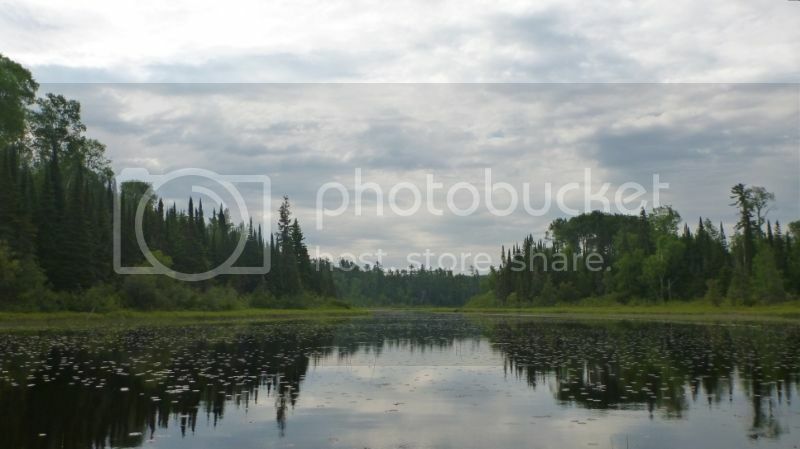 You may also find the south bay leading into Bark Lake to be very shallow. I'm interested in this area. Your report contains lots of really useful information regarding campsites. Nice photos, too. Thanks for sharing. 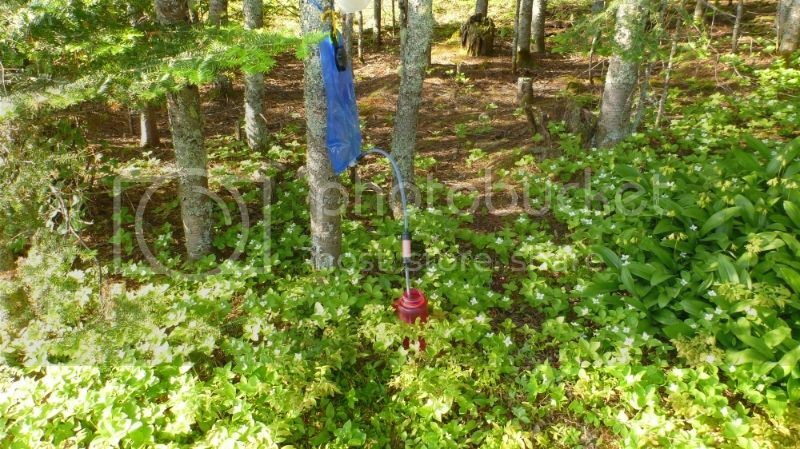 Pardon my ignorance, but how would you know if there was a bear bait station? Looking it up online, I get pictures of barrels or sometimes a mess of swampy looking food in a pile. I think they're just about the only ones up around there baiting bears. 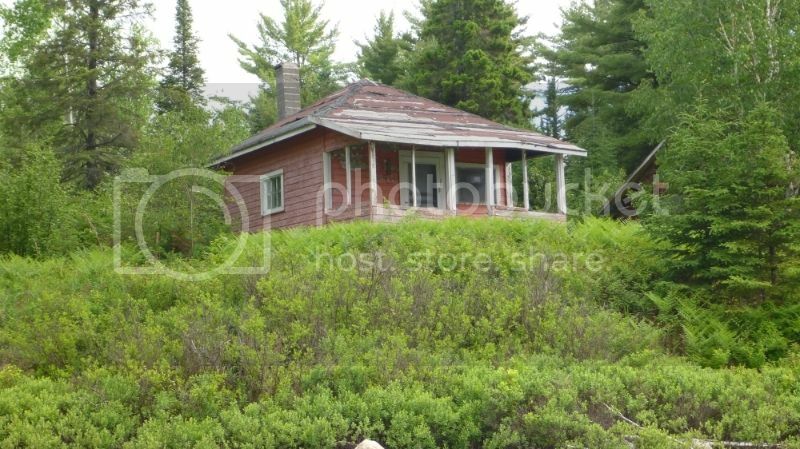 The lodge on Poupore Lake (used to be called Moosewa Outpost) was purchased by the Ritchie Falls folk a few years ago. If there are bait stations on the lakes, they would most likely be close to shore and probably flagged somewhere too so they're easy to find to re-bait. You could also contact Ritchie Falls Resort and ask about them if you're really concerned. I wouldn’t worry about it. There won’t be any baits on the portage trails. Yes, baits are usually in barrels that are secured somehow so that other animals don’t steal it on the bears. This is a question about road condition. Has anyone been up this way this year yet? I'm just wondering what the condition of the road after Ritchie Falls is? I was in about three years ago and the road was in good shape to Lac Aux sables for just about any vehicle. This was in contrast to about 10 years ago when it was harrowing to drive on in a sedan after the bridge at Ritchie Falls. I was up to Lac Aux Sables a couple weeks ago & answered my own question. If anyone is considering going this year, the road is fine for just about any vehicle if you're moderately careful. I drove in a sedan with 4" clearance from the bottom of the oil pan to the road. Just returned from my first ever trip up the road from Massey to Lac aux Sables. 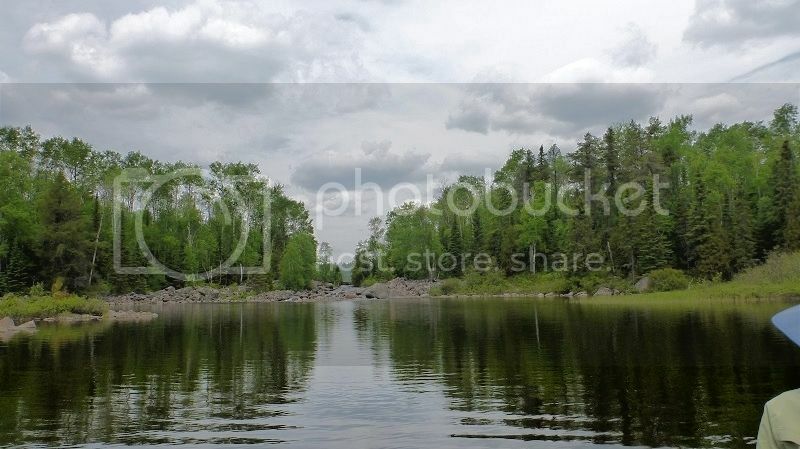 I did the trip up to Bark Lake where I base-camped for a few days. 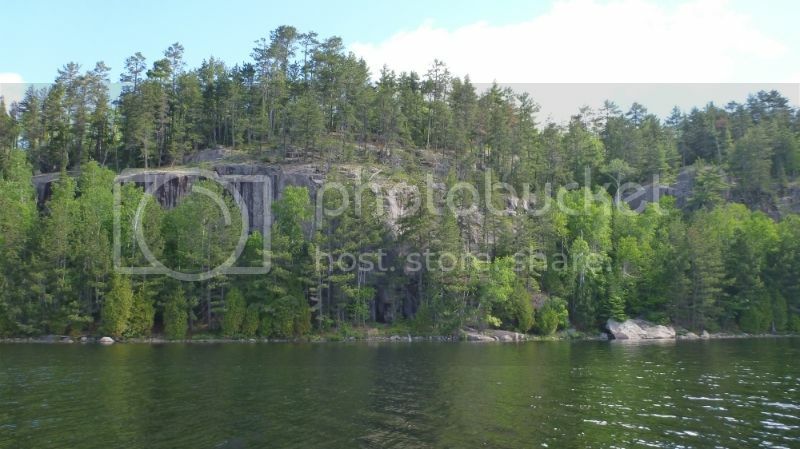 Day-tripped to Grey Owl's cabin, explored a short way's up and down the Mississagi and in and around Petre's Lake. 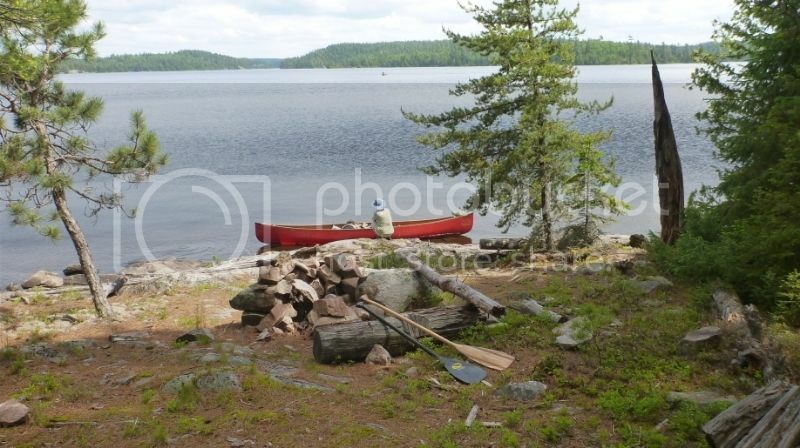 No other paddlers, but some fishing boat activity and generator buzz coming from the cottage at the Grey Owl cabin site. Water levels were very low. Lots of wading in the river between Little Trout and Lac aux Sables. I returned by the same route, so didn't do the loop through the small lakes. A big thank you, Darryl and Rosa, for the T.R. and campsite info which was a useful resource I used in my planning.